Mexico has gotten a lot of press recently, and my compassion goes out to those disrupted by quarantines and health fears. 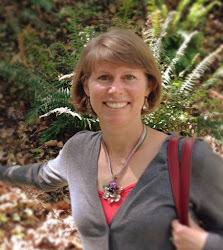 In spring of 2002 I traveled to Mexico City with my husband and our good friend Tim. I was so taken by the culture, history and scenery, that I hope to travel there again someday. The Zocalo in Mexico City blew me away. I hope you enjoy these photos as much as I enjoyed looking at them again. Now, I just need to figure out where the parks and playgrounds are for my next trip. Maybe I'll check out Photo Friday for ideas. I love the bird's eye view of these pictures! Thanks for sharing! Just another reminder of how my family must head south one of these days! 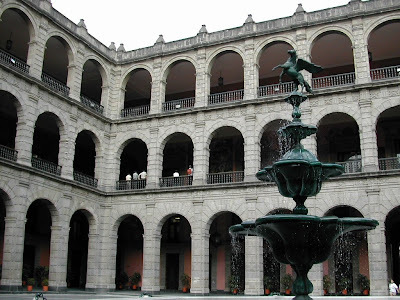 I passed on a chance to study in Mexico City, and would really like to go there. I love the beautiful vintage architecture of Latin American cities. When I first stepped into the Zocolo, I was in shock!!! I had no idea what to expect, and to find out that this is the second largest plaza in the world, was not what I was anticipating. 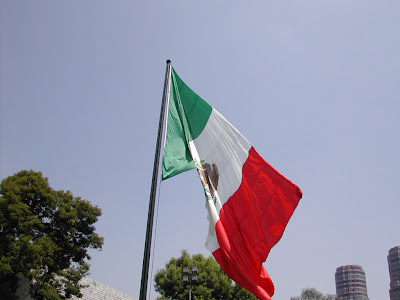 I loveeeeeeeeeee Mexico City! It is one of the most gorgeous places I've visited in Latin America. 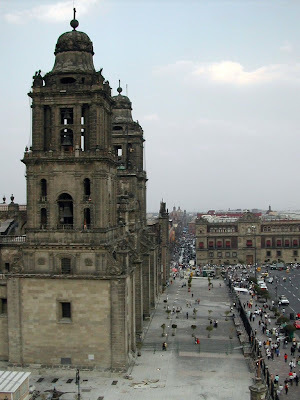 Mexico City looks like such an amazing place, with so much history and culture. Great vantage points! I love plazas like this. That is a HUGE plaza! Great perspective! I've been to that exact spot in Mexico City but I'm still trying to figure out where you were standing to be able to be able to take that spot?? Thanks for the comments, it was indeed a great experience to see such a vast square up close. 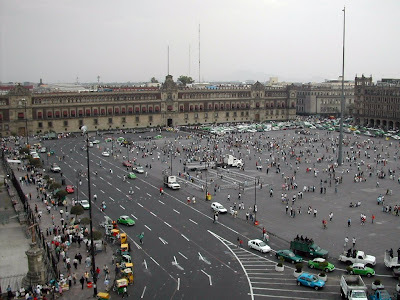 The vantage point is from a terrace cafe in one of the buildings bordering the zocalo. Amazing view. Wow, what a lovely place! I have never been able to explore Mexico. It is so neat seeing photos of other countries. So different from the US! What a lot of people... and wide sidewalks! I've never been to Mexico, and never really have considered it as a potential travel destination - these photos may just change my mind!